With week 37 in the Premier League this weekend we get the joys of extra matches with eight teams playing an extra set of games in midweek just prior to the final day. This also means that FPL managers get a final double game week to stack their team and make a final push in the rankings. Now that Leicester has clinched the Premier League title, there are going to be questions about how well they will play in their final two matches. This weekend they host Everton, who are only playing for pride and go into Saturday’s match on the back of a hard fought win. It certainly helps the Foxes that they were able to clinch early enough into the week to get all of the celebrations out of the way early. The other factor in their favor is the fact that they are playing at home and will certainly want to prove something for the home fans. The race to fill out the remaining three places in the league is well and truly on now. While Manchester United should be able to get a win over Norwich to open the weekend, this is a team that has already beaten the Red Devils earlier this season. With United being four points behind fourth place Man City and seven behind Arsenal in third, this is a must win match. Their midweek match at West Ham is even more so considering that the Hammers are just a single point behind United. Considering their recent form they should be able to defeat Swansea at home on Saturday to keep their hunt for a European place intact. While these matches are big, the biggest in terms of filling out third and fourth place will be Sunday’s game between Man City and Arsenal. At the time of writing Man City still have to travel to Madrid for their Champions League semi-final against Real Madrid. This certainly put a lot of pressure on the team over the weekend when they were soundly beaten 4-2 by Southampton. Meanwhile Arsenal will be able to completely focus on preparing all week long with the goal of pushing Tottenham for second in the league. There is every chance that the Gunners can still leap frog Tottenham and ensure another season finishing higher than Spurs. Tottenham themselves play a recently resurgent Southampton to open Sunday’s matches. Following their throw away 2-2 draw at Chelsea, their season looks rather deflated and could very well affect how they are able to come out against the Saints. At the bottom of the table it’s a very tight three way race between Newcastle (33 points), Sunderland (32 points), and Norwich (31 points) with just a two point difference between the three. All three are desperate for points and especially so for wins. Only Newcastle was able to come away from week 36 with a win, but both Sunderland and Norwich have a two matches in week 37. While Norwich has lost three matches in a row and face Manchester United first, they do take on a struggling Watford at home in midweek. Sunderland, meanwhile, have two tricky matches against Chelsea and Everton, both of which are mid table teams with little to play for except pride. Newcastle’s lone match of the weekend should be a win considering they are playing already relegated Aston Villa. While the Villans were able to get some goals last weekend, their biggest weakness in defense let them down to a 3-2 loss at Watford. It’s hard to see them being able to get any points, even at home, against a Newcastle team led by Rafa Benitez and pushing for crucial points. Come back on Friday for my fantasy Premier League tips to help set up your team for the last double game week of the year. This is going to be a massive set of matches for all FPL teams and could really shake things up depending on which teams still have wild cards or chips left to play. 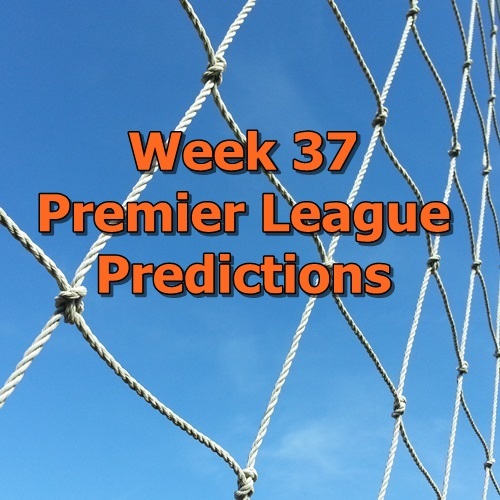 I am certainly looking forward to the matches this weekend and with so much still left to play for many teams, it should be an exciting week 37 in the Premier League.